While folks love to smoke cannabis, it has been primarily used orally as a tincture for most healing applications in modern history. While smoking does provide a pleasant experience and offers some pain relief, most patients find the best therapeutic results with a whole plant tincture that can claim the benefits of The Entourage Effect. Cannabis researcher, educator and founder of LeBlanc CNE, Jerry Whiting specializes in crafting cannabis tincture formulations that are second to none. His long-time experience as a CBD cannabis grower gives him a familiarity with the plant that allows him to choose the best strains and grow thriving plants for his tinctures. His heavy use of cannabis analytics in the LeBlanc research and development phase gives him numerical support for aspects that many formulators guesstimate on. Because of this emphasis on testing and spreadsheets, LeBlanc CNE tinctures are exceptionally easy to dose and have reliable results. Their tinctures are extracted into alcohol to obtain the full spectrum of cannabinoids present in the plant. Some of the alcohol is vaped off to concentrate the medical properties and then vegetable glycerin is added to make the tincture easier to take orally without a burning sensation. Sunflower lecithin is also added to increase the body absorption. While LeBlanc produces a series of tinctures for a variety of ailments and with a few branded partners, they all are signed off on by Jerry Whiting who knows patients are relying on his expertise and dedication to accuracy. 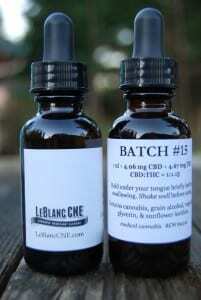 Their most popular tincture is the LeBlanc 1:1 tincture with equal parts CBD and THC. This is a favorite for many because the THC is backed up by a healthy serving of CBD which softens the THC experience and offers a wide range of therapeutic effects on its own.